After his settling at Paris, he appears to have become an author by profession, as we do not find that he had any place or preferment. His first piece, published the same year in which he quitted the society of the Jesuits, was entitled “Histoire du Stadhouderat.” He next published “Histoire du Parlement d’Angleterre,” which gained him much reputation, though it had little claim to the title of history, and was tinged with many prejudices, religious and political. 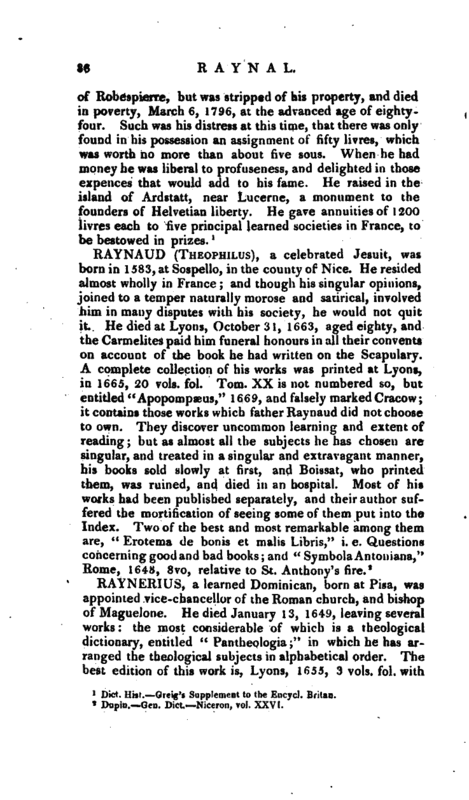 He also composed “Anecdotes Literaires,” in three volumes, 12mo; and “Memoires de Ninon de PEnclos;” and was much employed in the “Mercure de France.” But the work upon which his fame is chiefly built, is his “Political and Philosophical History of the European Settlements in the East and West Indies.” That this history is written in an animated style, and that | it contains many just reflections, both political and philosophical, is known to all Europe for it has been translated into every European language. Its beauties, however, are deformed by many sentiments that are irreligious, and by some that are impure. It was followed, about 1780, by a small tract, entitled “The Revolution of America,” in which the author pleads the cause of the revolted colonists with a degree of zeal, censures the conduct of the British government with a keenness of asperity, and displays a knowledge of the principles and intrigues of the ‘different factions which at that period divided the English nation, that surely was not natural to the impartial pen of a philosophic foreigner. Hence he has been supposed to have been incited to the undertaking, and to have been furnished with part of his materials, hy some persons who opposed the measures of the English government, and secretly fomented the American cause. Be this as it may, he propagated, both in this tract and in his history, a number of licentious opinions respecting government and religion, of which he lived to regret the consequences. 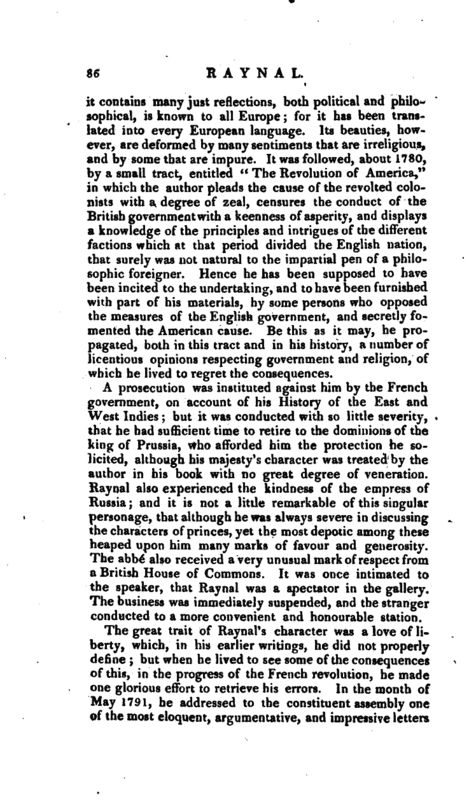 A prosecution was instituted against him by the French government, on account of his History of the East and West Indies; but it was conducted with so little severity, that he had sufficient time to retire to the dominions of the king of Prussia, who afforded him the protection he solicited, although his majesty’s character was treated by the author in his book with no great degree of veneration. Raynal also experienced the kindness of the empress of Russia; and it is not a little remarkable of this singular personage, that although he was always severe in discussing the characters of princes, yet the mostdepoiic among these heaped upon him many marks of favour and generosity. The abbe also received a very unusual mark of respect from a British House of Commons. It was once intimated to the speaker, that Raynal was a spectator in the gallery. The business was immediately suspended, and the stranger conducted to a more convenient and honourable station. 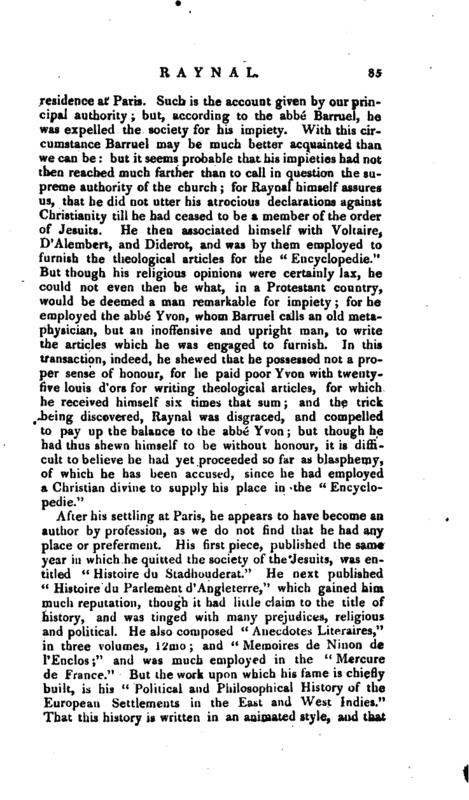 The great trait of Raynal’s character was a love of liberty, which, in his earlier writings, he did not properly define; but when he lived to see some of the consequences of this, in the progress of the French revolution, he made one glorious effort to retrieve his errors. In the month of May 1791, he addressed to the constituent assembly one of the most eloquent, argumentative, and impressive letters | that ever was written on any subject; a letter which, if the majority of them had not been intoxicated with their newly-acquired consequence, must have given some check to their mad career. One consequence of this letter was very singular. Those who could not answer it, nor resist the conviction of its arguments, wreaked their vengeance on liaynal, by endeavouring to prove that he did not write the celebrated History of the Indies; and this became the cant of the day. To illustrate this, we shall give the following extract of a letter from an English gentleman then in Paris, addressed to the editor of one of the London newspapers. 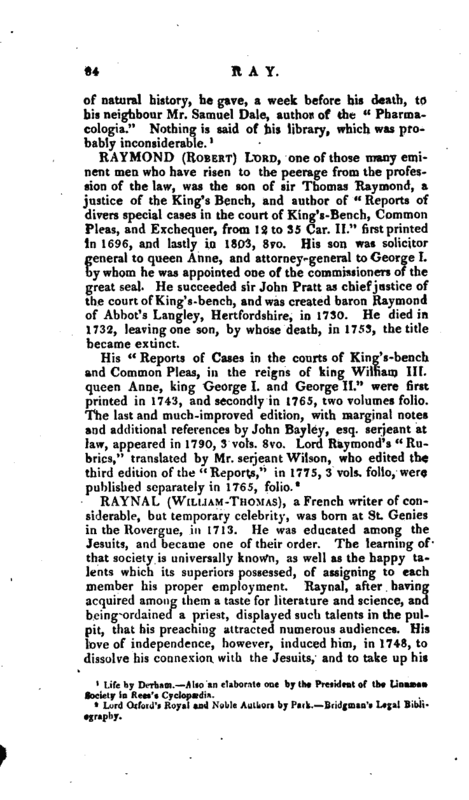 “I am sorry to add,” says this gentleman, f ’ that the reputation of the abbe Raynal in Paris, where he is personally known, is very different from what he enjoys in London, where he is only known as an author. That Philosophical history which you ascribe to him, is really, in no proper sense, his work; but was produced by a combination of the labours of several ingenious men, among whom I am inclined to think, he contributed the smallest part. We might indeed give him some credit for lending his name to a book, which contained so many bold truths, which it was then dangerous to publish; but even here, there is need of caution; for under the ancient system, deceit and fraud were carried to such a pitch of refinement, that it was not uncommon for men of letters to concert stratagems with ministers, to get themselves put into the Bastile, to raise their reputation, and to make their fortune in the world. Whatever be in this, you may ascribe the history of the European settlements to Perrijeat la Roque, Dubreuil, Diderot, Nargion, or Holbach, who were all concerned, as well as the abbe Raynal." 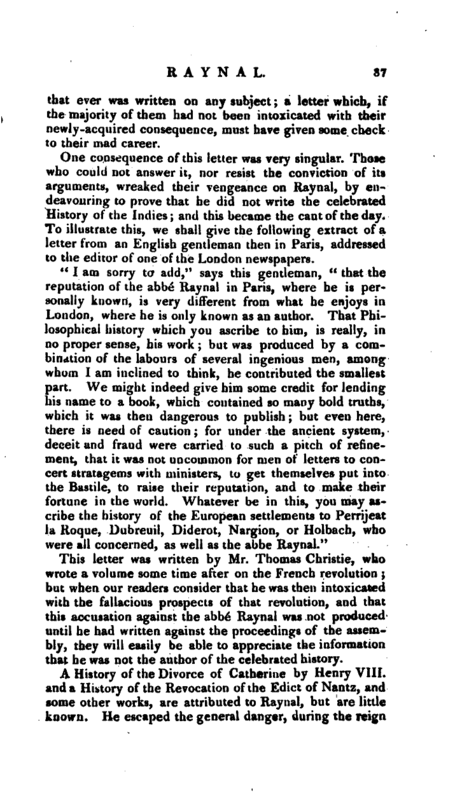 This letter was written by Mr. Thomas Christie, who wrote a volume some time after on the French revolution; but when our readers consider that he was then intoxicated with the fallacious prospects of that revolution, and that this accusation against the abbe Raynal was not produced until he had written against the proceedings of the assembly, they will easily be able to appreciate the information that he was not the author of the celebrated history. Dict. Hist. Greig’s Supplement to the Encycl. Britan.